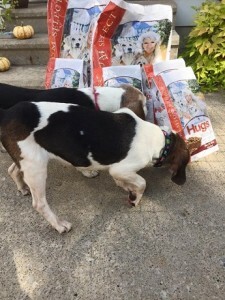 Back in August, we shared the exciting news with you that dog food our friends’ at Hugs Pet Products, who have licensed several of our innovative pet products, created with none other than Paula Deen, was selling on her website’s General Store and the Hugs Pet Products website! Since that time, not only has the Paula Deen Hugs Premium Select Pet Food begun selling in K-VA-T food stores throughout Kentucky, Virginia and Tennessee, it recently reached a little closer to home and to the heart as Davison and Hugs Pet Products were involved in a pet food donation to Midwest Beagle Rescue, Education and Welfare (BREW). 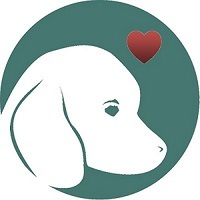 Aside from helping beagles find a carefully-screened and loving, forever homes, BREW works with local veterinarians, trainers and boarding facilities to give these dogs the proper medical care that they need and deserve. This all-volunteer organization also serves as a community resource for pet owners by providing them with the right education, important information, positive behavior training and good nutrition. It was the last point that made it a no brainer for Davison and Hugs to help this great cause by donating bags of the new products. Once a month, the Midwest BREW holds an adoption event at a PetSmart in East Liberty, a local Pittsburgh neighborhood. This great event gives this organization the chance to not only showcase their beagles, but also to raise awareness for their rescue mission. 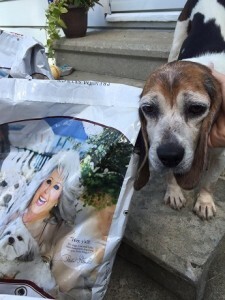 At the event, a dog named Dandelion, whose previous owner we’re told would only feed her once per day by throwing her food on the ground, is now able to go home and enjoy a delicious meal from Paula Deen, thanks to her free Chicken and Rice flavored- Paula Deen Hugs Premium Select Pet Food. Dandelion’s foster dad, Bill, has been a foster parent for several years and appreciates the donation. But Bill and Dandelion weren’t the only ones to enjoy the delicious food. In fact, six bags of the Beef and Rice flavored- Paula Deen Hugs Premium Select Pet food were sent to a Midwest BREW volunteer in Toledo, Ohio. 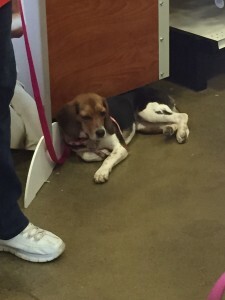 A beagle named Beauty and her foster mom, Sarah, were the happy recipients of this donation. Our Founder and CEO, Mr. Davison, offered his support in more ways than one. Not only did he offer his sentiments, he also wanted to donate even more to the Midwest BREW. “It is such a beautiful thing you are doing. 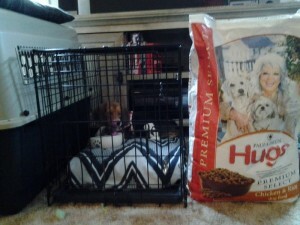 Please let me know when you are ready for more of Paula’s Dog Food and we will be happy to help,” said Mr. Davison. It’s organizations like the Midwest BREW and its selfless volunteers that motivate us to continue helping others. Learn more about the Midwest BREW and how you too can help this great cause! That’s a Wrap for the Global Pet Expo!